Pave-Land is Unity’s 1 3/4" and 2" thick rubberized safety surfacing, flooring and paver products that are made from 100% recycled tires and rubber. These double tiles/mats/blocks/pavers have a unique self-interlocking design with “Button-Lock™” Technology that offers bolt down capabilities.....features that can ONLY be found here. They used to sit, walk, travel and/or play on. 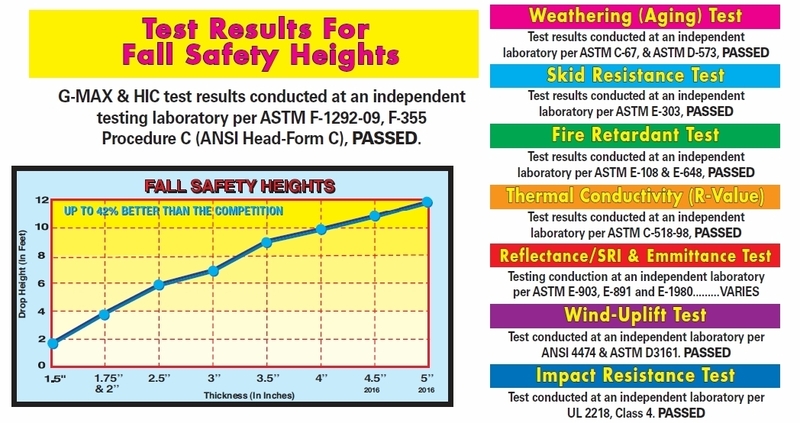 Passing a five (5’) foot “drop height test” and many other safety tests…..including wind up-lift for rooftop applications, this product is ideal for: small playgrounds , rooftop: offices, apartments, hotels, buildings sustainable green roof, patio and/or terrace (big and small), daycare centers, recreational areas, pools & patios, walkways, basements and marina & docks. They are used in many other applications that are found indoors and outdoors as well as acoustical areas and even walls. SIZE, WEIGHT, LONGEVITY, SAFETY, QUALITY, DURABILITY is the core of Unity’s products. They are easy to clean. They do not displace during usage resulting in consistent shock absorbency year round. The low life cycle costs make for very good footing and help to prevent leg fatigue. Pave-Land does not harbor foreign objects, such as glass commonly found in loose filled materials, nor does it require constant maintenance. There are no retaining edges needed and all of Unity’s rubberized safety surfacing, flooring & paver products are accessible to the handicapped. They are also water permeable to allow for “free flow drainage” to a drainage outlet......ideal for storm-water management issues They are easy to install and are fully warranted, presenting a superior product that no one can match. Hard materials such as concrete (cement) and blacktop (asphalt) are very unsafe to sit, stand, walk and/or play on, and increase the likelihood of leg fatigue and injury. They fall short of providing safety to an area as well. Loose filled products attract cats and dogs to use as their litter boxes. Bees, hornets, wasps and other insects tend to use these same surfaces as their new homes. Everyone dislikes the fact that loose filled materials build up in ones sneaker or shoe and can be tracked into a clean home, building, school, facility or daycare center. Unity solves these problems by providing you with a solid unitary, resilient rubberized safety surfacing, flooring and paver product that is clean and safe to use, indoors and out. Unity has created an impressive way to turn unwanted rooftops into usable spaces, while at the same time providing thermal and mechanical protection. The performance, long term value, color diversity and safety of our products has satisfied architects, engineers, designers building owners and managers economical needs of renovation and/or retrofit projects. As a member of the “United States Green Building Council” you may be eligible to receive “LEED” points and/or credits when using our products and services such as these. Our High Density Wear-Top is manufactured using recycled rubber in conjunction with a wide variety of slip resistant Pigments and/or blended EPDM/TPV material, coupled with our specially formulated binders. These high density, textured wear-top options are resilient and won't crack, puncture or heave in the most hostile of weather conditions. This versatility is unmatched and provides year round use to the end-user. The patented C-shaped self-interlocking design is built directly into the product itself, It locks tightly together thanks to the supporting "back-wall", which prohibits unnecessary separation, curling, pealing, shifting and wind up-lift. It is installed with our specially formulated glue/adhesive, while still providing unlimited access to sub-base materials for any maintenance related issues. 4. Eliminates future problems such as expansion and contraction which may encourage wind up-lift and/or vandelism. Contributing to design, our interlocking system can provide a monolithic “step & repeat” method of installation that allows anyone to stagger the products interlocking joints anywhere as if you were installing “brickwork”, commonly known as a “staggered bond” or “running bond” method of installation. This technological development acts as a backup to resist product-to-product separation, curling, peeling and most importantly wind up-lift. These patented systems, along with the sheer size, weight and durability of our product allows architects, engineers, designers, municipalities, building owners and operators to truly set the standard by which all others are measured. Additionally, size does matter in this case as it allows installers to install (almost) twice the square footage per man hour then the conventional square tiles, a savings that is unmatched in the industry today. Another patented feature that we have to offer is the BOLT-DOWN capabilities of our products. This unique system is found within the male portion of our interlocking joints to provide added strength and security. It is counter-sunk, and laboratory tested, to avoid any “hard-spots” within the product itself. It is capable of being placed under the most extreme environmental conditions and/or usage. WE DO NOT RECOMMEND THE “BOLT-DOWN” PROCEDURE ON ROOFTOPS WHAT-SO-EVER. WE DO NOT RECOMMEND THE “BOLT-DOWN” PROCEDURE ON ROOFTOPS WHAT-SO-EVER. The pre-molded size of the “Pave-Land” products are 22” (inches) by 44” (inches), which equals 6.72 sq. ft. per unit. Please allow for a ¼” tolerance due to heat related expansion and contraction of our recycled rubber products. Click HERE to download a PDF version of our Pave-Land series “Product Description” and “Architect Specifications” for your review and consideration.